Is it just me, or is this a movie that most of us missed when it came out theatrically in January of 1998? 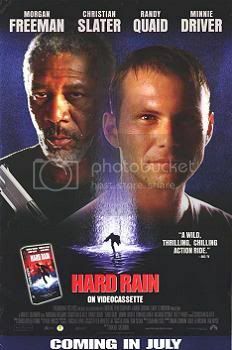 I honestly don't remember a thing about any ads or previews for the theatrical release of Hard Rain. When I first saw the Blu Ray this year I was intrigued when I saw the cast. Christian Slater, Morgan Freeman, Randy Quaid, Minnie Driver, Edward Asner, and Betty White (!) - that is geniunely a noteworthy cast. So when I found the Blu Ray a few weeks later for $6.00 I thought, "Why not?" Having watched the movie I can honestly say it was well worth the money. It might not have been worth $15 or $20, but for $6.00 it was a purchase that I'm happy with. The plot is pretty simple - a pair of armored truck drivers/guards are ambushed during a major rainstorm that is causing a flood somewhere in the midwest. This is a well planned hijacking, but the flood has thrown off the theives plans a little. When one of the guards is shot and killed that throws the plan out of the window. The lone remaining guard (Slater) takes the money and runs in an attempt to thwart the thieves. The movie is almost entirely set at night, and it is that dark, rainy, flooded setting that makes the movie work visually. After opening with some rather bad CGI composite shots that morph into real footage the film actually looks really good. Much like Film Noir directors and cinematographers used shadows to hide cheap sets (thus making them look better and more realistic) the use of darkness and rain works here. The movie looks pretty darned good. The rain and flood and the small town look real. But what about the story? And the acting? It's not bad. Not bad at all. This is an action movie where much of the action moves fairly slowly due to the water, but that actually adds to the tension. The characters are believable enough, and the actors do a good job with the script. 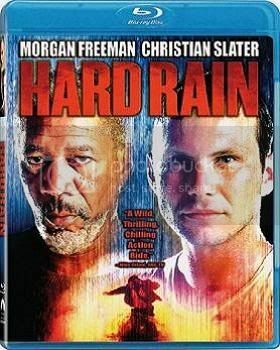 Slater gives a fairly understated performance (which works well), while Morgan Freeman is, well, Morgan Freeman. He's got his thing going on, and (as usual) it works. There's just something about old Easy Reader that comes across as genuine or real. He doesn't seem to be acting. The rest of the cast is good as well. Quaid keeps his quirky style in check, and Minnie Driver does a little with what little she's given to do. Betty White comes across much like she did in her role on That 70's Show - shrill and angry, but with just a touch of humor. Ed Asner is fairly good with his small(ish) role, and his professionalism shines through. He, like Freeman, is geniune in his role and doesn't really seem to be acting. So what we've got is a chase movie, more or less, with the chase taking place entirely within this small midwest town. The bad guys are chasing Slater to force him to reveal where he hid the money, and he's doing everything he can to keep them from getting it. A plot that simple is often overloaded with exposition or unnecessary plot details to fill out a script. Not so here. The focus is like a laser. This isn't a great movie, or even a very good one, but it's fairly good and fairly entertaining, so the goals of the producers and director are successfully achieved. As for the Blu Ray, it looks fine. Since most of the movie takes place at night in the rain with a few feet of water on the ground there isn't a lot of detail to show. However, the shadow detail is fairly good and there isn't a lot of digital noise present, so this is a good transfer to Blu. 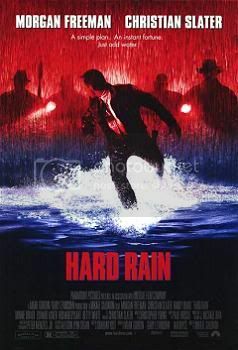 Hard Rain is nothing groundbreaking or new (although the flood setting is a fairly novel approach for an action movie), but it is fairly creative in it's execution and entertaining overall. It doesn't overstay it's welcome, either.